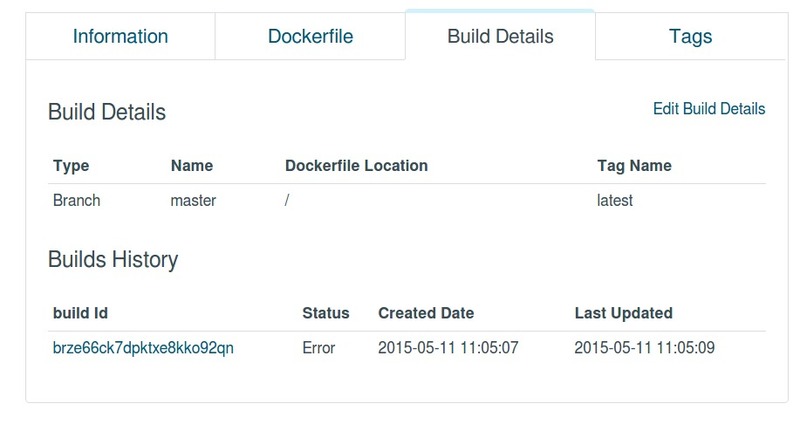 Using docker build, tag, and push inside of our buildspec.yml file to publish our latest image to ECR. Pulling the latest image from our registry and running it locally. Now that we have the lay of the land, let�s talk about how we can extend our usual CI/CD Terraform template to support building Docker images. Incorporating ECR into our CI/CD Pipeline. To get started we first need to create... Set up Automated builds Estimated reading time: 18 minutes How Automated Builds work. Docker Hub can automatically build images from source code in an external repository and automatically push the built image to your Docker repositories. The portion before the slash of the repository name�is going to be your Docker Hub username.�What we can do is build another image�from our Docker file and tag it with a different name,�docker build with a -t to tag it with leebrandt�and some sort of tag name.�But even simpler than that,�we can just tag our existing image with a new name,�running docker tag.�... I have a docker images tagged as me/my-image, and I have a private repo on the dockerhub named me-private. When I push my me/my-image, I end up always hitting the public repo. In this article, you'll learn how to build a docker image for running a spring boot application. I'll first give you a brief idea of docker, then we'll create a docker image for our spring boot application, and run it locally. Finally, we'll push the docker image to docker hub. Build a Docker image Before you can build a Docker image, you need to enable access to the Docker daemon by simply adding the docker: true option to your bitbucket-pipelines.yml file. Here is an example of how to build a Node.js application as a Docker file.